Arabic pharmacology, a branch of scientific literature dealing with the preparation and application of compound drugs as formulated in the Arabic language, is an interdisciplinary subject and an intercultural discipline. This article describes its Greek, Indian, and Chinese origins and illustrates the multicultural character of Arabic pharmacology by examples taken from life. Figure 1. Dr. O. Kahl during his speech at 1001 Inventions Conference. Pharmacology, perhaps more than any other science in the so-called Middle Ages of Islam, lies at the crossroads of various other scientific genres – medicine with its philosophical basis of humoralism; botany, zoology, and mineralogy; alchemy insofar as its chemical principles may be concerned; and even astrology as it was occasionally used for the purpose of medical prognostication. Arabic pharmacology, that is to say the branch of scientific literature which deals with the preparation and application of compound drugs as formulated in the Arabic language, is therefore by its very nature an interdisciplinary subject. And it is no surprise that this quality left a mark on the intellectual attitude of those who studied that subject. But there is also a vertical dimension which meets the horizontal plane of intersecting disciplines, and which manifests itself in the realm of general history rather than science proper. The rise of Arabic pharmacology from truly humble origins as Bedouin herbal lore and its rapid development into a superior scientific structure is a most remarkable historical event which depended on the coincidence of different factors. First, there is the Arabic reception of foreign scientific traditions in the course of a translation movement which took place between the middle of the 8th and the end of the 10th centuries CE in Baghdad, and which acquainted the Arabs with the medical and pharmacological theories and practices notably of the Greeks and Indians – either by way of direct translations from the Greek and Sanskrit or via Syriac and Pahlavi intermediate translations; the translation movement also played a major role in the evolvement of Arabic into a language of science and philosophy. Then there are the commercial and to some extent cultural relations between the Muslim world and China, which brought the Arabs in contact with certain aspects of Chinese herbal medicine. And lastly there is the enormous geographical extension of the Arab empire with its network of transcontinental trade routes which made possible the acquisition and relatively safe transport of medicinal drugs, and many other things, from literally all corners of the known planet. The fact that the early pharmacologists were almost all deeply involved in the translation movement and therefore often bilingual if not multilingual individuals some of whom were neither Muslims nor indeed Arabs, certainly contributed to the formation of a rather cosmopolitan view of the world. As the Arabic share in the adaptation of foreign scientific traditions grew, the relevant literature became more and more refined. In the following, we will take a look at the Greek, the Indian, and then the Chinese contributions to the development of scientific pharmacology among the Arabs, and where appropriate illustrate the multicultural character of Arabic pharmacology by examples taken from life. Figure 2. Al-Razi (Rhazes) on the cover of a modern Persian book. Source: reproduced from the article "Al-Razi"
The transmission of Greek thought to the Arabs in the course of the translation movement had a huge impact on the development of Arabic science in its formative period. Insofar as Arabic pharmacology is concerned we must mention by name three important Greek texts which were available in Arabic translations by the middle of the 9th century CE: first, the book entitled On Medical Matters by Dioscorides, an army doctor who lived in the 1st century CE; second, the book entitled On the Mixing and the Properties of Simple Drugs by Galen, a physician who lived in the 2nd century CE; and third, the book entitled On the Composition of Medicinal Drugs by the same Galen. These texts not only broadened the horizon of the Arabs for their actual contents, they also provided patterns of formal arrangement and scientific organization. During this time the Arabs also became acquainted with the so-called Summaria Alexandrinorum, a summary of sixteen books of Galen compiled around the year 600 CE in the medical school of Alexandria – this summary of Galenic writings introduced to the Arabs the concept of humoralism, which was to dominate all later medical and pharmacological theories. Turning to the transmission of Indian scientific texts to the Arabs, we must emphasize that we still know relatively little about this aspect of the translation movement. But we do know that the Arabs, as early as the beginning of the 9th century CE, possessed translations of important Sanskrit works on botany, pharmacology, and therapy, including the classical writings of the pre-Islamic Hindu physicians Sushruta, Charaka, and Vagbhata. Apart from providing the Arabs with a vast amount of practical knowledge, the Greek and Sanskrit texts thus translated also gave them, almost over night, a massive lexicon of technical terms. Incidentally, even the word for ‘pharmacy', as it is still used today in the Arab East, is of Sanskrit origin. There is a nice little anecdote in Arabic biographical literature involving the Abbasid caliph Harun al-Rashid, who is well-known also from the tales in the Arabian Nights. According to this story, Harun al-Rashid fell ill one day and none of his physicians was able to cure him; when somebody mentioned to him a famous Indian physician by the name of Mankah, the caliph dispatched an envoy to India to track him down, shower him with presents, and bring him to Baghdad; Mankah came, cured the caliph, and stayed on to translate Sanskrit medical and pharmacological writings into Persian and Arabic by commission . As far as the Chinese influence on Arabic pharmacology is concerned, we have no records of any texts that would have been translated from Chinese into Arabic in the course of the translation movement. But there is ample evidence that the Arabs were in contact with the Chinese from at least the middle of the 8th century CE. The detailed geographical knowledge alone, which the Arabs had about China at the end of the 9th century CE, presupposes long-standing and well-established relations in more than one direction. Trade flourished, and both the land- and sea-routes between China and West Asia served the import and export of all kinds of goods, including medicinal drugs, and the exchange of medical knowledge. The early use of Chinese herbal medicine by Arab pharmacologists is well-attested already in manuals dating from the first half of the 9th century CE. There existed, around the year 800 CE, a sizeable Chinese community in Baghdad, made up of former prisoners of war who had decided to settle down in Iraq. But also in China itself things were not static. In his book entitled Miscellany of the Yu-Yang Mountain Cave, written in the year 860 CE, the Chinese scholar Tuan Ch'eng-shih recalls a discussion about medicinal drugs involving a Chinese, an Indian, and a Byzantine monk. In the year 923 CE, the Chinese botanist Li Hsün wrote a book entitled Medical Matters from the Countries beyond the Sea, in which he studied 121 medicinal drugs from the ‘West', that is Indo-Arabia, and made at least fifteen completely new entries to the Chinese lexicon. 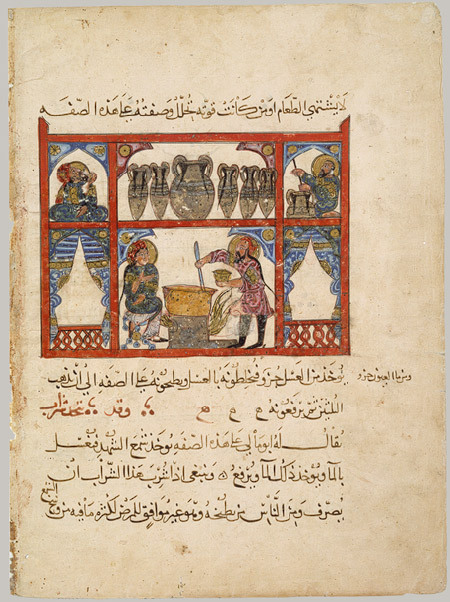 And then there is this highly instructive and curiously overlooked account in Ibn al-Nadim's bibliographical work al-Fihrist , featuring the famous physician and alchemist Rhazes who lived in Baghdad for some time around the year 900 CE. In this account, Rhazes says: "A man from China came to seek me and lived with me for about one year. In five months of this time he learned to speak and write Arabic and developed a good understanding of the language. When he desired to return to his country, he said to me a month in advance, ‘I am about to leave and wish that someone would dictate to me the Arabic translation of the sixteen books of Galen, so that I can write them down'. I said, ‘Your time is short and you will not be able to copy more than a small part of it'. But the Chinese insisted, ‘Please devote yourself to me for the length of my stay and dictate to me as fast as you can – I will keep up with you in writing'. So I got some of my students to join in this project, and we dictated to him as fast as we could; but we did not have faith in the man until there was a chance for comparison and he showed us everything he had written. I questioned him about the matter and he said, ‘We have a form of shorthand known as grass-writing, which is what you see; if we need to write a great deal in a short time, we write it with this script; later, if we wish, we convert it into a script which is familiar and not abbreviated'. He thought that it takes 20 years to learn this". 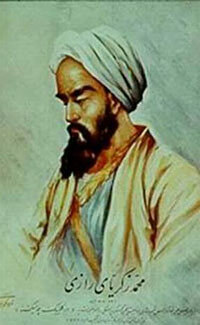 It is worth noting that the point of this story is not that a Chinese physician came to Baghdad around the year 900 CE, learned Arabic, and then wanted to take the books of Galen with him back to China – none of this was considered exceptional; what prompted the story is the possibility that anyone should be able to write that fast. Figure 4. Sample from the Hyderabad edition of the Continens of Rhazes, showing a double column of a pharmacological table; the 'ideographs' are placed in the right-hand sides under the heading 'unknown', their common equivalents in the left-hand sides under the heading 'known'. If we go a step further now and link this story to certain views which Rhazes held on the linguistic aspects of Arabic pharmacology, we will realize the full scale of intellectual exchange. In order to follow the plot one must remember that the Arabic script does not normally express vowels, that many consonants are only distinguished by little dots, and that an unusual word can therefore easily be misread and corrupted. When those Greek and Sanskrit pharmacological texts were translated into Arabic, it was found that a significant number of especially botanical terms had no equivalent in the Arabic language. So the translators decided to simply transliterate these terms, that is they replaced the letters of a foreign word by Arabic letters which roughly represented the same sounds. In the course of time, some of these new entries took on a specific and generally accepted form, but many escaped by constantly changing their forms under the hands of ignorant copyists, and began to lead an independent and for the specialist rather annoying existence – it was clear what they meant, but it was not at all clear how exactly they should be written and transmitted, let alone be pronounced. This is where Rhazes comes in again. In the 22nd volume of his medical encyclopedia known in the West by the title of Continens, Rhazes deals with precisely those awkward and elusive pharmacological terms . He places them with all their variant forms in one column of a table, asserts their respective meanings in another column, and introduces this huge list by a brilliant suggestion, namely that these terms should neither be read nor pronounced at all but rather be treated as "pictorial images". A ghost-word thus becomes an ideograph, a symbol that represents the idea of a thing rather than its name – which is exactly the principle whereon the Chinese system of writing is based. Whether or not Rhazes got this flash of inspiration from his Chinese lodger is of course impossible to say, though I believe it is quite likely. In any case the true significance of Rhazes's move lies in the fact that with it he also anticipated by centuries the pharmaceutical system of generic naming. See Manfred Ullmann, Die Medizin im Islam (Leiden-Köln 1970), p. 106 note 2. Ed. Gustav Flügel (Leipzig 1871), pp. 16ff. Ed. Hyderabad 1390H/1971, especially pp. 61-68. 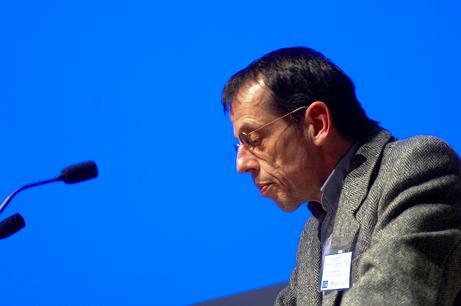 * Dr. Oliver Kahl, Department of Middle Eastern Studies, School of Languages, Linguistics and Cultures, University of Manchester.